Additive-free kimchi flavored in the style of the people of Qingdao, China. Our Kimchi Value Pack, a new product that comes in easy to use bottles. Made with coarsely ground red pepper and pickled to taste, the seasoning blend used turns the entire product a vibrant shade of red. Our Kimchi Value Pack is made from quality ingredients, including an array of healthy vegetables and a delicious seasoning blend. Produced, prepared, and packaged in China, the red pepper and amishirokara paste blend adds striking and inviting flavors to any dish. 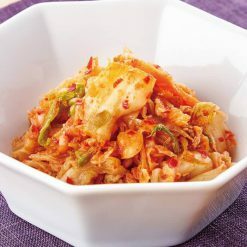 Great as a side dish or paired with alcohol, our Kimchi Value Pack brings out a pleasant acidic flavor to other ingredients it is used with, and it pairs excellently with vegetables, fish, or meat. Rich in vitamins A, B, and C, kimchi is a healthy choice that also provides a unique, delicious flavor along with a satisfying texture. Similar to that of yogurt, its fermentation process helps with post-meal digestion. To defrost, thaw in the refrigerator. Can be served immediately afterwards. As the product’s acidity increases with time, it is best served as soon as possible after thawing. Well-known as an excellent pairing for alcoholic drinks, kimchi is most commonly eaten as a side dish, or as an additional ingredient in hot pot or fried rice. It is also often thrown in udon, ramen, or yakisoba dishes for extra flavor and texture. For a hearty and invigorating start to your morning, add a few pieces from our Kimchi Value Pack to your omelette or scrambled eggs. 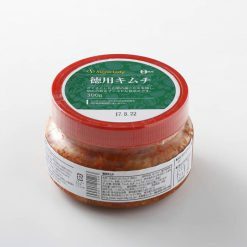 This product contains chinese cabbage, pickled raw ingredients (including radish, rice flour, red pepper, garlic, amishiokara paste (includes shrimp), onion, sugar, maltose, kelp, green onions, ginger, carrot, and salt). This product is not suitable for anyone with allergies to shrimp. Origin of ingredients: Chinese cabbage (China). Prepared and packaged in China.